With skulls carved above the doorway and winged skeletons etched into plaques outside, the exterior of St. Mary of Eulogies and the Dead suits its macabre name. Once inside, visitors can make a small donation to the church and a nun will unlock the crypt for you. The nun will take you down a short flight of stairs and leave you alone, surrounded by skeletons. 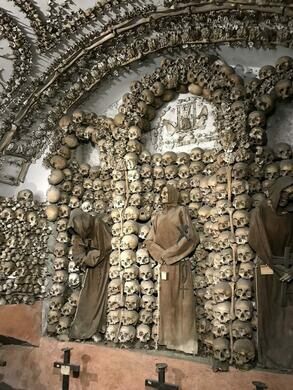 There are skeletons set in the wall, etched skulls stacked on shelves, bones piled by the altar and made into a cross. 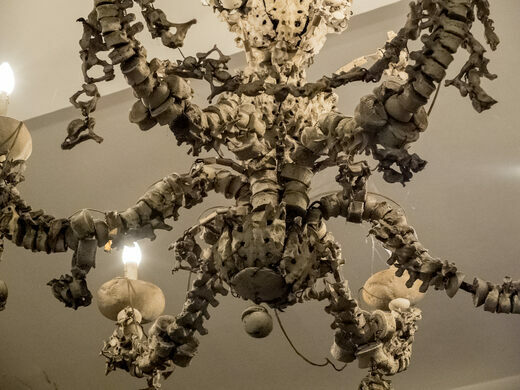 Even the chandeliers are made with human vertebrate. A scythe lurks near the altar. The stretcher in the corner offers a clue to the story behind the crypt. The church was established in 1576 to provide a proper burial for abandoned corpses. While it used to include huge vaults where over 8000 bodies were buried, most of the vaults were destroyed during other construction in 1886. This chamber is all that remains. Update August 1, 2016: Closed to visitors for renovations, didn’t say for how long. Update Aug 15, 2018: Still closed to visitors for renovations. It’s 8.50€ to get in per person and there are absolutely no photos allowed. It’s very strictly enforced is cameras and staff constantly monitoring especially the crypt area.